While the number of people out of work in Louisiana is one of the lowest in the U.S., the biggest city in Louisiana suffers from a decline in jobs, not just since Katrina, but going back at least twenty years. 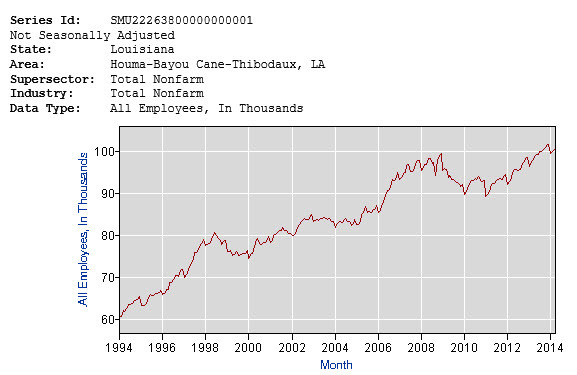 The actual number of people employed in the New Orleans area is lower than it was twenty years ago, according to The Bureau of Labor Statistics, which tracks employment in each state and further breaks down the employment into Metropolitan Areas such as New Orleans. 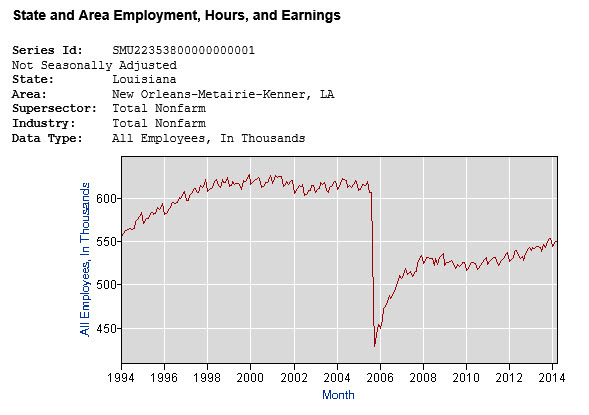 The data in the table below shows during the 20 year period from March 1994 to the most recent figures of April 2014 that the New Orleans | Kenner | Metairie area experienced a decline in employment of 12,000 people, from 563,000 to 551,000 non-farm employment, not seasonally adjusted. The not seasonally adjusted numbers are the most current. 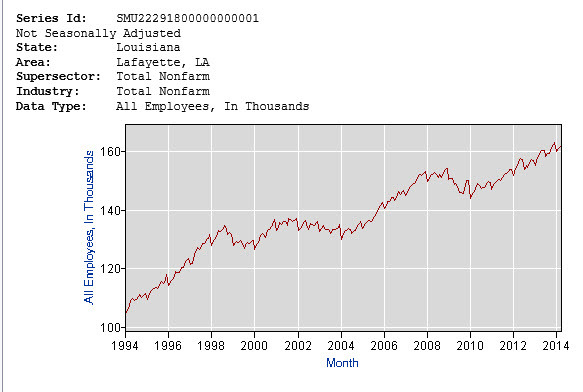 Employment in New Orleans did have a couple of growth periods: first, the two year period from 1996 to 1998, and, second, the recent four year period from 2010. 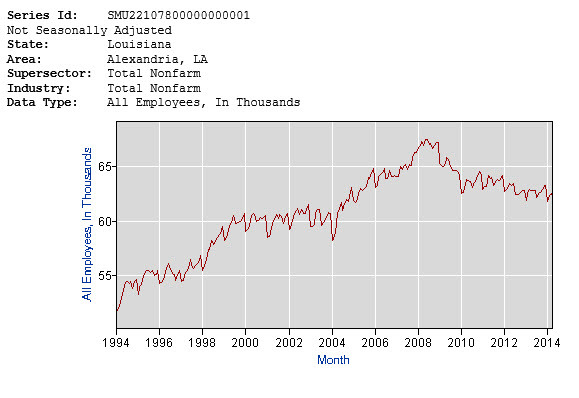 The rest of the twenty year time span saw employment stagnant for almost a decade from 1997 to 2005, then the 25% decline in 2005-2006 due to Katrina, a bounce back of 15% in 2007-2008, then flat to down employment until 2010, as in the chart below. During the last 20 years, the state of Louisiana has grown employment by 268,000, from 1,699,000 to 1,967,000, a change of 15.77 percent. During the last 20 years, Alexandria has grown employment by 10,000, from 52,000 to 62,000, a change of 19.23 percent. 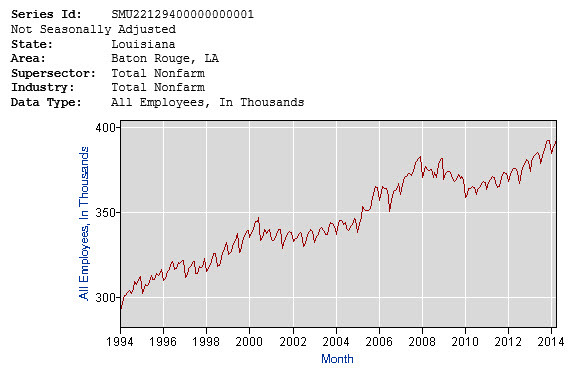 During the last 20 years, Baton Rouge has grown employment by 93,000, from 301,000 to 394,000, a change of 30 percent. 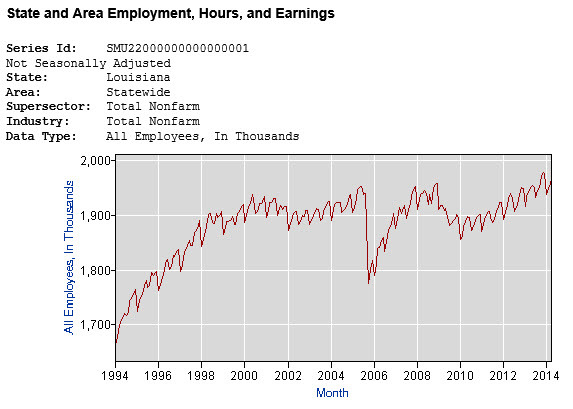 During the last 20 years, has grown employment by 38,000, from 62,000 to 100,000, a change of 61 percent. During the last 20 years, Lafayette has grown employment by 55,000, from 107,000 to 162,000, a change of 51 percent. 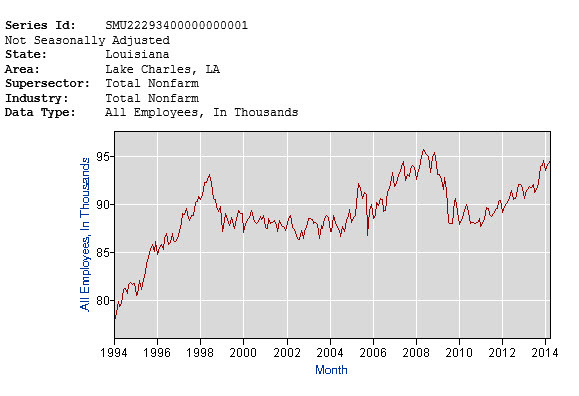 During the last 20 years, Lake Charles has grown employment by 15,000, from 79,000 to 94,000, a change of 19 percent. During the last 20 years, Monroe has grown employment by 12,000, from 66,000 to 78,000, a change of 18 percent. 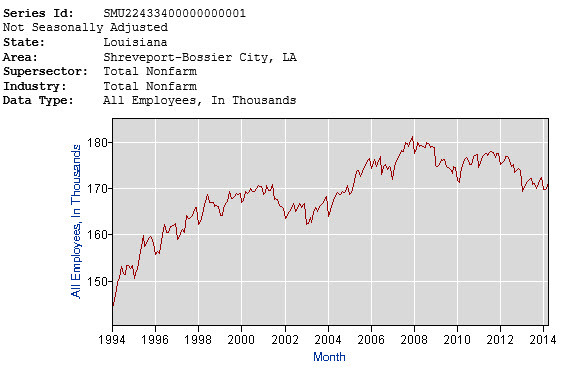 During the last 20 years, Shreveport has grown employment by 23,000, from 148,000 to 171,000, a change of 15 percent. Even through the state of Louisiana currently reports one of the lowest unemployment rates in the nation at 4.5 percent, not all areas of Louisiana have grown their employment the last 12 months. For example, Shreveport suffers from a reversal of the Haynesville Shale boom, and Alexandria experienced the largest decline at 0.6 percent. 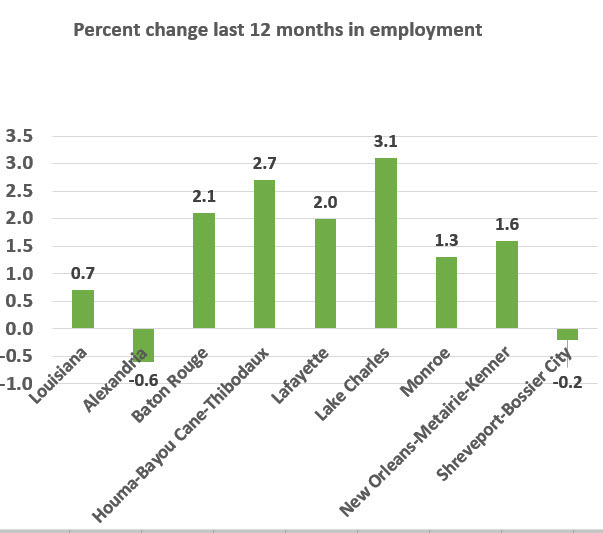 The biggest improvement in employment the last 12 months has been in Lake Charles, followed by Houma, Baton Rouge and Lafayette, as shown in the chart below. 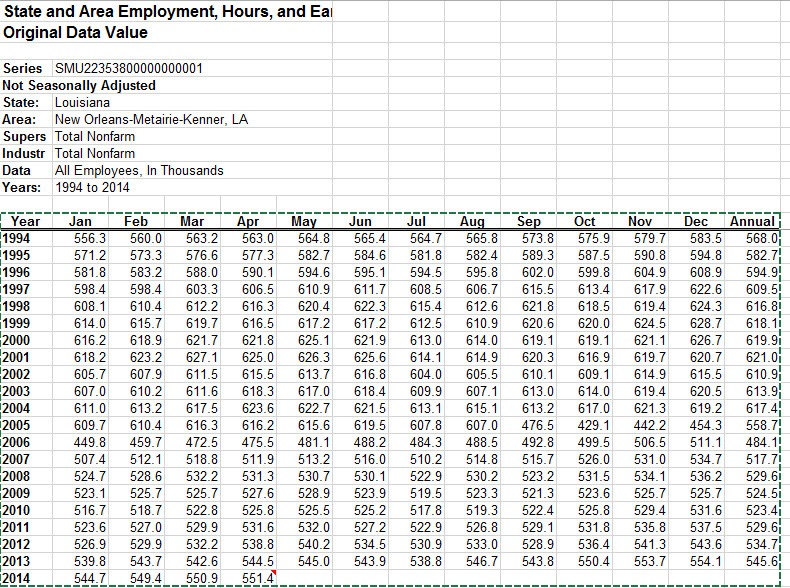 All data is current and from the Bureau of Labor Statistics.